Prostate cancer is the development of cancer in the prostate, a gland in the male reproductive system. Most prostate cancers are slow growing; however, some grow relatively quickly. The cancer cells may spread from the prostate to other area of the body, particularly the bones and lymph nodes. It may initially cause no symptoms. In later stages, it can lead to difficulty urinating, blood in the urine or pain in the pelvis, back, or when urinating. A disease known as benign prostatic hyperplasia may produce similar symptoms. Other late symptoms may include feeling tired due to low levels of red blood cells. Factors that increase the risk of prostate cancer include older age, a family history of the disease, and race. About 99% of cases occur in males over the age of 50. Having a first-degree relative with the disease increases the risk two to threefold. Other factors that may be involved include a diet high in processed meat, red meat or milk products or low in certain vegetables. An association with gonorrhea has been found, but a reason for this relationship has not been identified. An increased risk is associated with the BRCA mutations. 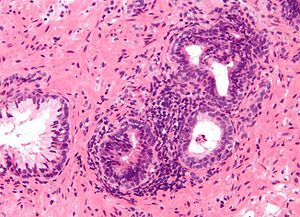 Prostate cancer is diagnosed by biopsy. Medical imaging may then be done to determine if the cancer has spread to other parts of the body. Many cases are managed with active surveillance or watchful waiting. Other treatments may include a combination of surgery, radiation therapy, hormone therapy or chemotherapy. When it only occurs inside the prostate, it may be curable. In those in whom the disease has spread to the bones, pain medications, bisphosphonates and targeted therapy, among others, may be useful. Outcomes depend on a person's age and other health problems as well as how aggressive and extensive the cancer is. Most people with prostate cancer do not end up dying from the disease.